Magnetizer is the most powerful magnet available. If you are a skeptic who only trust in harmful chemicals like chlorine to keep your swimming pools clean because that's what you have been used to all your life, then read the article which appeared in the New Scientist titled MAGNETS HELP DISINFECT SWIMMING POOLS. Also be sure to read Technical Principles of Water Magnetization which shows that magnets can in fact kill Escherichia coli (E-Coli). These articles prove what many pool owners know to be true. Join the thousands of pool owners that are using much less chemicals in their pool and enjoying a more toxic free life. We also encourage you to begin learning about the dangers of drinking and bathing in chlorine treated water. • Improves chlorine effectiveness so you need less. • Dissolves swimmer oils, lotions etc. With MAGNETIZER chlorine/bromine can be substantially reduced (as much as 60%) with safety because Bacteria and algae are under constant attack by MAGNETIZER’s powerful focused field to limit and control their growth. The reduction of water surface tension and the increased ionic activity combines to make chlorine/bromine more effective as a sanitizing agent. Numerous minute particles (i.e., dirt, skin cells, debris, body and tanning oils, etc.) get into the water, and because they are so small, simply pass through the filter and continue to buildup. This makes the water dull, irritating and unattractive. as well as interfering with the sanitizer’s effectiveness. This build-up of foreign particles and the reaction with the sanitizer causes burning eyes, dry skin, dry hair and chemical odor. The normal cure is to super-chlorinate to burn off or oxidize these minute particles. Super-chlorination is expensive and makes the pool/spa unusable for some time. MAGNETIZER’s powerful focused field polarizes these particles and binds them together in large enough clumps to be efficiently removed by the filter system. The result is a system that seldom needs to be super-chlorinated. Skin oils, tanning lotions, skin cells and minerals in the water also combine at the water line to create a “bath tub ring”. Removal of this ring requires a chemical to dissolve and hard work to remove. The chemical used to dissolve this rings gets into the water to add to water control problems. MAGNETIZER breaks the emulsion of the oils in water and keeps it in suspension until it coagulates into clumps to be filtered out. In addition, magnetized water will remove built-up scum that has already attached itself to pool/spa surfaces. The speed with which this happens varies from a few days to a few weeks depending on its composition. Except for vacuuming the dirt that falls to the bottom, MAGNETIZER makes a pool/spa almost self-cleaning, resulting in less labor cost. pH is the measure of acidity and alkalinity in the water. When pH fluctuates (either too highor too low) it can render the sanitizer ineffective and cause expensive damage to equipment. pH fluctuations are caused by either a deficiency or excess of electrons. pH control is normally done by chemicals that are either rich in excess electrons or have a shortage of electrons. MAGNETIZER naturally supplies the necessary electrons to the water by passing it through a powerful magnetic field in the same way electricity is generated by passing a wire through a magnetic field. This natural, continuous supply of electrons (pH adjustment) occurs without additional chemicals and its resulting cost. Although water never wears out, it can become saturated with foreign substances such as foreign particles and chemicals. MAGNETIZER helps at two levels. First, particles that would normally pass right through the filter (both suspended and dissolved) take on an electrical charge that causes them to clump into larger particles (called ion floc clusters). These ion floc clusters are then filtered out by the filter system that has itself taken on the elec-trical charge. This process is known as polarized media filtration. Secondly, since fewer chemicals are required in a MAGNETIZER system, there is less chemical build-up. The true cost of draining a pool/spa is not only the water to refill it but, also the labor, energy to reheat, chemicals to rebalance and the inconvenience caused by out-of-service systems. 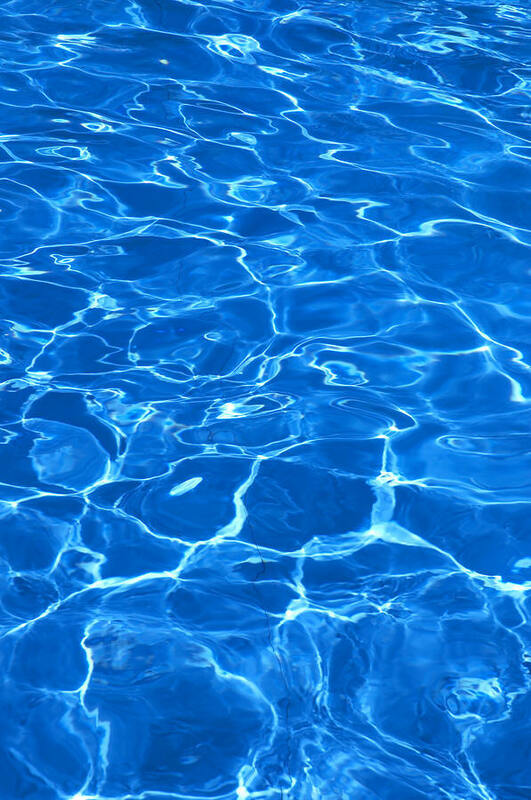 The normal safe pH operating zone for operation of a pool/spa is between 7.4 and 7.6. Above that range, ugly scale can begin to attach itself to surfaces, inside of the plumbing and on the inside of the heater. Scale build-up of only ½ inch will increase heating costs by as much as 60%. When the pH is below 7.4, corrosion begins to attack the expensive metal parts of the system (heater, filter, pumps, etc.) and can cause pitting on the pool/spa surfaces. In addition, corrosion of the metal parts puts minerals into suspension in the water. These minerals will cause unsightly stains on the pool/spa surfaces. Once stained, the surfaces must be acid washed and in most cases refinished. The result is unnecessary expense and an outof-service system. 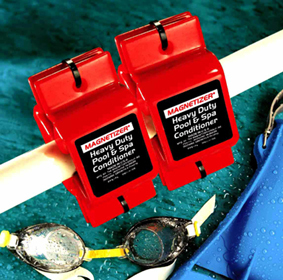 MAGNETIZER extends the safe pH operating range without worry about scaling, staining or corrosion. The result is a system that protects your investment and reduces maintenance cost. MAGNETIZER quickly pays for itself in reduced chemical costs. Although chemical costs are important and easy to identify, the real savings is in the labor of not having to use as many chemicals, monitor the results, scrub the sides, take more frequent than necessary readings, change water, acid bath and refinish. Reduced maintenance adds up to real dollar savings for commercial users and more time for enjoyment for private owners. MAGNETIZER doesn’t just save time and money in the short run; since it controls corrosion; it adds long term protection to your investment. Although cost and time savings and protection of equipment are important, the real benefits come from clearer, cleaner and more sanitary water. Magnets have long been claimed to have beneficial effects on water. Conventional science is skeptical of such claims and no explanation of the phenomenon has been generally accepted so far. Now researchers at Cranfield University report that magnetized water increases the effectiveness of bleach (sodium hypochlorite) in disinfecting swimming pools. Their experiment involved two 25 L test pools which had been dosed with bacteria, sweat, and urine to simulate the conditions in an actual public swimming pool. The water supply to one of the pools passed through a pipe to which three permanent magnets had been attached while the control pool was supplied through a pipe devoid of magnets. The researchers found that the disinfectant (sodium hypochlorite) was 30 per cent more effective in killing Escherichia coli bacteria when added to the pool containing magnetized water than when added to the control pool. They also found that the magnetized water maintained its level of free chlorine significantly longer than did the control water. They speculate that the magnetic treatment may make the disinfectant more soluble, may cut losses of chlorine through evaporation or perhaps may somehow change the chemistry in the pool making the chlorine less likely to react with the amines in the bathers' sweat and urine. This study determines the efficacy of a magnetic treatment device on the inactivation of a model micro-organism (Escherichia coli), chlorine consumption and concomitant disinfection by product formation in swimming pool water. Effects of magnetic water treatment on physical parameters such as scale deposition; conductivity and pH are reported, as well as the key performance determinants of chlorine consumption, micro-organism inactivation rate and trihalomethane (THM) formation. A commercially available magnetc treatment device (MAGNETIZER) was used throughout. It was found that in all cases chlorine loss was more rapid in the control than in the magnetically treated water. The bactericidal efficiency of the free chlorine was unaffected by magnetic treatment, such that the E. coli kill rate for a given disinfectant dose was increased by an average of 25% by this physical conditioning. In addition, it was found that generation of THMs was reduced by magnetic treatment at any one free chlorine level. In short this stuff works folks!